William Delbert Gann was born on 6 June 1878 in Lufkin, Texas. His father, Samuel Houston Gann, was a teacher who traded in cattle and horses. He also owned a billiard hall. Gann’s mother, Susan Rebecca Gann (nee Trevation) spent much of her time raising W.D. Gann and his younger brothers and sisters. She taught the young William to read using the Bible – a book that was to later influence his thinking on the nature of markets. Gann’s family was poor. Samuel, Susan and their eight children lived in a small house, and young William had to walk seven miles to school each day, for three years. Gann never attended high school. In 1894, William Gann, at the age of 16 years, obtained a minor’s release, which allowed him to leave full-time schooling and seek employment. Gann became a news butcher (someone who sells newspapers, food and so on) on a train that traveled between Texarkana and Tyler, in Texas. He also worked in cotton warehouses. In 1901, while working in a broker’s office in Texarkana, Gann married his first wife, Rena May Smith. In 1902, their first daughter was born – Nora. 1902 was also the first year that Gann had his first trade in cotton. In 1903 Gann moved to New York. He was 25 years of age. 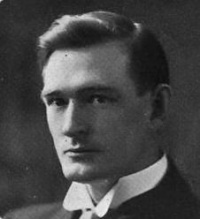 In 1905 his second daughter, Macie Burnie, was born. On 12 September 1905, an article appeared in the Texarkanian, giving Gann’s view on cotton prices. In 1906 Gann worked as a broker in Oklahoma City. In 1907 Gann made huge profits after predicting the panic in stocks and the fall in commodities. In 1908, at the age of 30, Gann divorced Rena May and married his second wife, 19 year-old Sadie Hannify. His two daughters moved to New York to live with their father. It was in this year that he discovered his ‘Master Time Factor’. He traded two trading accounts. The first he opened with $300, and he made $25,000 in a period of three months. The second account started with $130 and he made $12,000 in the same 30 days. In 1909 Gann and Sadie had their first child, a daughter they named Velma. By this time Gann’s had established his reputation as an exceptionally talented trader. ‘William D. Gann An Operator Whose Science and Ability Place Him in the Front Rank His Remarkable Predictions and Trading Record’. During the month of October 1909, in twenty-five market days, Mr. Gann made, in the presence of our representative, two hundred and eighty-six transactions in various stocks, on both the long and the short side of the market. Two hundred and sixty-four of these transactions resulted in profits, twenty-two in losses. The capital with which he operated was doubled ten times, so that at the end of the month he had one thousand percent on his original margin. We have seen him give in one day sixteen successive orders in the same stock, eight of which turned out to be at either the top or the bottom eighth of that particular swing. The above we can positively verify. Such performances as these, coupled with the foregoing, are probably unparalleled in the history of the Street. Gann acknowledged having made half a million dollars from his trading over the previous few years. In 1910 Gann wrote his first book, Speculation a Profitable Profession. He also produced newsletters such as The Busy Man’s News and later his famous Supply and Demand Letter. In early 1914 Gann predicted a world war and a panic in stocks. In 1915 his son John L. Gann was born. In March 1918 Gann successfully predicted the end of World War I and the abdication of the Kaiser. His prediction was acknowledged in many leading newspapers, including the New York Times. In 1919 he commenced working for himself. He published his Supply and Demand Letter, which included annual forecasts for stock and commodity markets. In 1923 Gann wrote Truth of the Stock Tape. This book was widely acclaimed by some as the best book ever written on the stock market. In a period of 60 days, Gann made more than $30,000 trading cotton, with a starting capital of less than $1,000. Mr. Gann’s latest book deals with the future war in the air, which tells you about the cycles and rules found in the Bible for forecasting the future of nations and stock and commodity markets. It goes ahead until 1932, giving hints on the coming campaign in stocks, cotton and grain. A fascinating, mysterious love story is interwoven with scientific knowledge, making this book interesting reading as well as instructive to men and women in every walk of life. In 1928 Gann successfully forecast the top of the bull market for September 3rd, 1929, and forecast that the greatest panic in history would follow. In 1930 Gann wrote Wall Street Stock Selector. In this book he described the market conditions from 1931 to 1933. In 1931 Gann became a member of the New York Rubber Exchange and The New Orleans Cotton Exchange. In 1932 Gann made a recommendation for his clients to buy stocks at the time of the Great Depression low. In 1936 Gann wrote New Stock Trend Detector, and bought his purpose-built all-metal airplane ‘The Silver Star’. He was the first individual in the United States to own, privately, a metal airplane. Over the years he bought a number of airplanes. His pilot for 19 years was Elinor Smith. Gann also bought real estate and high-powered cruising boats. In 1937 Gann wrote How to Make Profits Trading in Puts and Calls. He divorced his wife Sadie in this year. In 1940 Gann wrote Face Facts America. In this book he explained why Germany would lose World War II and why the United States should not enter the war. He also outlined the major problems he saw with the United States Government’s ‘New Deal’, and their consequences. In 1941, Gann became a member of the prestigious Chicago Board of Trade. He campaigned strongly against Roosevelt and his ‘New Deal’. This was at a time when the United States government had its largest budget ever (at the time), and the Ford Motor Company had to stop production for one year due to a severe lack of sales. In 1941 Gann wrote How to Make Profits in Commodities. The original 1941 edition had W.D. Gann and his son John as the authors. In 1942 Gann’s wife Sadie died at the age of 53 years. In 1944 he married his third wife Londi, who was 30 years younger than he was. Gann treated her like a queen, much to the disapproval of his children. Gann then moved to the warmer climate of Miami, in Florida, where he traded, invested in real estate and continued to teach his students. In 1948 Gann sold his trading company to Joseph Lederer in St. Louis, Missouri. membership based on the quality of this book. In 1950 Gann wrote The Magic Word. This was his contribution to biblical literature. On 23 May 1951 Gann established the Lambert-Gann Publishing Company, with Ed. Lambert. Lambert was best known for designing the highway system in Miami. This company published all of Gann’s books and courses. Gann updated and reprinted How to Make Profits in Commodities, removing his son John’s name and picture from the book. The 1951 edition was a huge success. Gann, at the age of 73, was still able to command a fee of US$500 per day for his consultancy services. He sold W.D. Gann Research, Inc. to C.C. Loosely in New York. In 1954, at the age of 76, Gann bought a high-speed cruising boat that he named ‘The Coffee Bean’, with the profits of a very successful commodity trade. Gann’s Great Master Course sold for US$5,000 in 1954. Gann suffered a heart attack, and soon after discovered he had stomach cancer. In 1955 W.D. Gann returned from one of his many trips to Cuba, where he loved to buy tickets in Cuban lotteries and bet on horse races. He was feeling ill and was very weak. His son John took his father from Florida to New York, where he was admitted to the Methodist hospital in Brooklyn. W.D. Gann died at 3.20pm on 18 June 1955. He was 77 years of age. Gann’s children arranged for Gann to be buried with his second wife Sadie, in the Masonic section of the Greenwood Cemetery in Brooklyn, on a hill overlooking the Manhattan skyline and his beloved Wall Street. John Gann was a pilot in World War II. He became very bitter towards his father, particularly after his father married for the third time. John Gann died in 1984. Ed Lambert did not actively promote or produce Gann’s books and courses, and as a consequence they became very difficult to procure until Billy and Nikki Jones from Pomeroy, Washington, purchased the Lambert-Gann Publishing Company and the copyrights to Gann’s materials in 1976. Ed. Lambert died in 1998. Billy Jones died in 1989 and Nikki Jones died recently. W.D. Gann was a pioneer in the field of technical analysis. Understanding that hard work was a key ingredient of success, Gann spent nine months working day and night in the Astor Library in New York and in the British Museum in London. He studied stock market data going back to 1820 and wheat data going back hundreds of years. He also studied in Egypt and in India. Some people claim that Gann theory is a wide range of unrelated discoveries. This is not true. Gann believed that the key variables of technical analysis (price, range and time) could be analysed in the same manner. His symbol, a circle with a square and a triangle inside it, summarises his analysis technique. Gann also made significant discoveries involving time cycles, including his famous Master Time Factor. He studied major cycles such as the 10-, 20-, 30-, 40-, 50-, 60-, 80- and 100-year cycles, and watched for market action of the past to be repeated in the future. For example, he called the fifth year of each decade the ‘year of ascension’. Every fifth year of the decade has been a bull market year, for both the All Ordinaries Index, and the Dow Jones Industrial Average, from 1905 until 1995. Gann discovered that markets regularly make tops and bottoms on seasonal times of the year (solstices and equinoxes), and on anniversaries of previous tops and bottoms. Gann was the first analyst to study and discover the relationship between time and price. In fact, he often wrote, “when time and price coincide, change is imminent”. He discovered what is today known as the ‘squaring of time and price’ and his ‘squares’ of 52, 90 and 144. Gann is often given the credit for inventing swing charts. He did not invent them, however he did popularize them and use them as the basis of his mechanical trading system – a very effective system for trading strongly trending markets. W.D. Gann made other discoveries – some rather esoteric. These include the Square of Nine and his other spiral calculators such as the Square of Four, the 360 Degree Circle Chart and the Hexagon Chart. These calculators can sometimes be used to forecast sequences of tops and bottoms in an impressive manner – but they are no holy grail! Perhaps the most controversial of Gann’s techniques was his use of Planetary movements as Cycle counts and Price indicators. He kept much of this work to himself, but some charts which came to light after his death have given important clues as to this remarkable method. We will never know if William Delbert Gann really did make the US$50 million that he is reputed to have made in the first half of this century. What we do know is that he was a true market master whose discoveries and trading rules are widely used throughout the world today – 60 plus years after his death.